Also, have some dancing zebras. Did not cry. Did not puke. Right leg seized up three times in that "oh crap, that's the bursitis" way that means that I have got to go and rest for a few minutes and until I do so nothing is going to make that leg a) hold my weight b) bend c) stop burning as if it were on fire. My new motto is "I will fall when I have no other choice, and not one second before". On the bright side, I'm, um, getting better at skating on only my left foot? Went for pho after and ate it very cautiously. I'm not kidding about the puking: that level of pushing my limits plus leg pain plus the shock of falling a lot = rebellious abdominals and an overwhelming urge to hurl. Carried my own gear up the stairs and spread it to dry. (Seriously, last week fairestcat carried my gear bag upstairs for me after practice and random laid all my gear out to dry and air because a) my spouses are the awesomest and b) ... I may have whimpered when I tried to grab my gear bag out of the car. Also last week was Jack, Cola, and Percoset in the tub and this week is Tramadol and Gin in bed. So that's an improvement. (Yes, I know that's dangerous. I have a chronic, incurable, pain-causing condition. My physician knows I do this sort of thing occasionally, and she quite frankly prefers it to having me use the strength of opioid I'd need without the booze so PLEASE DO NOT LECTURE ME. As one of the Vorkosigan siblings says in Mirror Dance or thereabouts, I am a PROFESSIONAL of pain. Things to work on when I am fresh and off skates so that I will become able to do them at the end of the practice without flopping like a carp: Planks. Planks with leg work. Pushups. Standing on one leg. Squats on one leg. Leg lifts. Things to work on whenever I get some free time on skates: footwork. Footwork. Footwork. More footwork. Getting up from a fall or single or double knee-stop or a baseball slide faster. Transitions. Environmental awareness. Jumps. The Carleton Sports Medicine Clinic can fit me in next Tuesday afternoon! 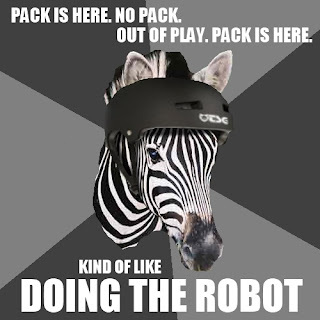 I could, in theory, be pain-free by Tuesday evening derby practice! Also, I have GORGEOUS new skates. *LOVES THEM*. They fit wonderfully. They feel amazing. Also, really REALLY good kneepads. Cassoulet made Friday and now finishing off in the oven. The hips are considerably better, but by no means fixed. The anti-inflammatories are murdering my stomach lining, so I'll be getting cortisone shots shortly. This will not remove the need for physio, it just buys me some slack to do said physio more effectively without causing myself massive pain. Nevertheless, I have taken up roller derby. Nobody ever said I had sense, though for at least this year and possibly forever I will be refereeing rather than playing. I am both Excited and Trepidatious. Signing up as a ref is definitely the way to go if one is interested in a sport but unsure of or insecure about one's welcome. Basically, you say "Hello, I'd like to spend many of my weekends and a certain amount of my own cash enabling your sport to continue, who do I speak to about that?" Be sure to brace yourself, lest the Head Ref, in her excitement at the prospect of being one step closer to the quasi-mythical condition of Enough Refs, crack your ribs when she clasps you to her bosom. Talking of bosoms, derby girls are hot, and I am about to be given nigh-unlimited permission to whistle at them. My life. So hard. I have made a roller derby icon, of which I am ridiculously fond. , for the lj folks. I am currently reading Helen MacInnes, who I find like very much indeed, and rereading Ian Fleming, who is a really good read once you figure out how to cope with the large wodges of Fail - my personal approach is that I do not actually LIKE Book!Bond very much, as a person - he's a great character, but that's different - so I quietly attribute the fail to him seeing the world through jerk-coloured glasses and move on. This MOSTLY works. I am still getting all of my stuff-outside-Canada news from Slacktavist, Ta-Nehisi Coates, and the Guardian. I am well-informed and consistently appalled. Talking of appalled I cannot BELIEVE this government. Seriously. I am late for my own damn carnival, but at least I finally know what I want to write. Also, on the grounds that trouble shouldn't always get stuck with the arguing, I used the silly little NDP app on my iPhone to Send A Message to Thomas Mulcair about accessibility. I've been awake for 24 hours and am not sleepy. This continues to be my life, interspersed with "I've been asleep for 18 hours and am not at all rested." At this point I'd even settle for a nice steady schedule of sleeping for 16 hours every second night or something. MY BRAIN, PEOPLE. I have just ordered a truly terrifying quantity of beans from Rancho Gordo. Like, about 70 lb, of which maybe 20 lb are for other people. I Blame Skud. And we're going to need more jars. We may have to resort to raiding the neighbourhood recycle bins. Life Sized Bouncy Stonehenge: Best Art Project EVER. I am mucking about clipping bits and pieces for a Burn Notice Vid. Based on my searches for same, nobody makes or watches Burn Notice vids, but a girl needs her windmills.